Henry Martin "Scoop" Jackson (May 31, 1912 – September 1, 1983) was an American politician. He was the United States senator of Washington. 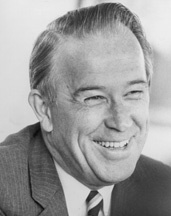 He served as senator from 1953 to 1983. He was a member of the Democratic Party. He ran for President of the United States during the presidential elections in 1976, but lost to Jimmy Carter during the primary. Jackson died in Everett, Washington from an aortic aneurysm, aged 71.